Chiropractor Loveland: Why Should You Get Adjusted By A Chiropractor? 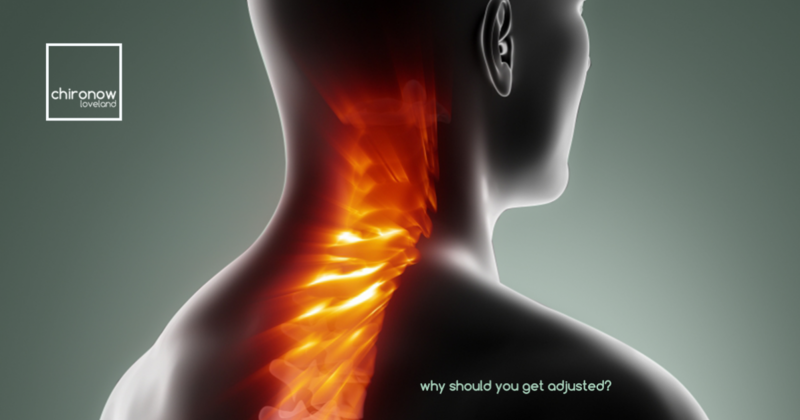 Why Should You Get Adjusted By A Chiropractor? It’s pretty crazy that just getting your spine aligned with a chiropractic adjustment can help alleviate and prevent many issues. Issues like ear infections, muscle and joint pain, asthma, constipation, colic, poor posture, headaches, high blood pressure and disc degeneration can all be alleviated with the help of a chiropractor in Loveland. The list goes on and on, really. If you’re looking to see a chiropractor but don’t want to schedule an appointment, choose our walk-in services at Chironow Loveland. Now imagine having misalignments in your spine that slow down the messages which can cause a worse burn. In order for the body to heal itself properly, the body must be in alignment so our bodies communication system runs at top speed. Getting chiropractic adjustments can do just this. At Chironow Loveland we offer affordable packages that families can share with NO expiration date. Let our chiropractor, Dr. Ryan, help bring back proper alignment and health to you and your loved ones. Whether you suffer from headaches or joint pain, we are here for you. Contact us today for more information.